This Samoa Pie is packed with everything you love about the famous girl scout cookies only transformed into a new unforgettable dessert! 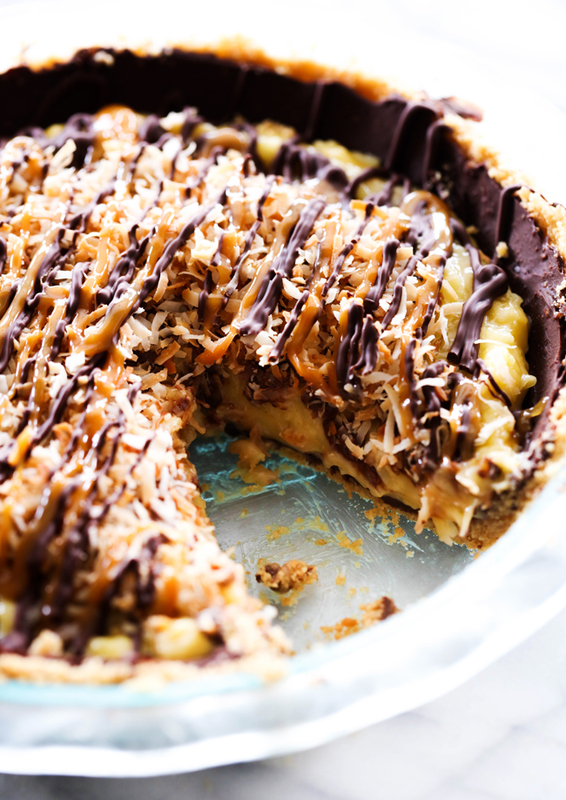 It has a shortbread cookie crust layered with chocolate and a delightful coconut filling. 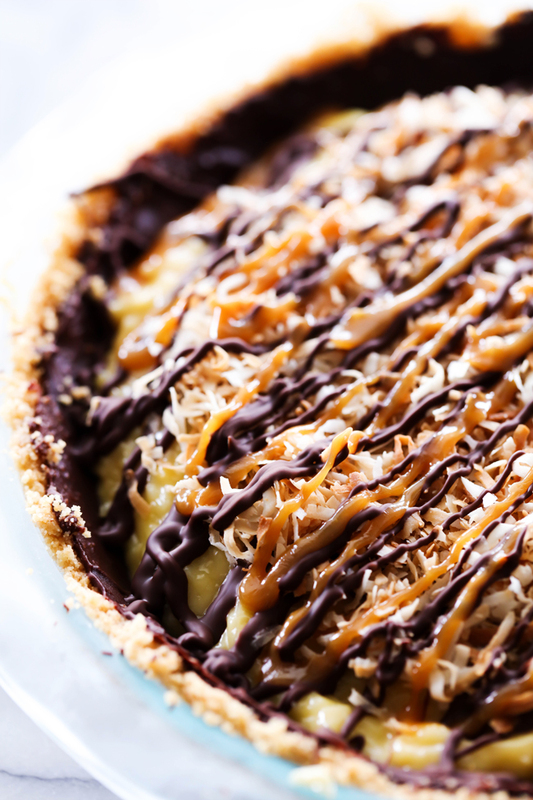 It is also topped with chocolate and caramel and toasted coconut for the perfect finishing touch! My family has been getting together a lot lately with all the holidays, reunions and babies being born. I am absolutely loving it! With all these get togethers come great food! This Samoa Pie was a huge hit! It brings together everything you love from the famous girl scout cookie and transforms it into one out of this world dessert. It begins with a shortbread cookie crust layered with chocolate and filled with an incredible coconut filling. To finish of the greatness, it is topped with toasted coconut, caramel and chocolate. This pie will be the talk of the party and one of the first things to disappear! Unwrap Lorna Doons and blend in a food processor until it produces a fine crumb. Place cookie crumbs in a medium mixing bowl and add butter. Mix well and press into a 9 inch pie pan. Melt chocolate chips in a microwave safe bowl with shortening. Heat in 30 second increments, stirring between each increment until chocolate is smooth and melted. In medium sauce pan, combine sugar and cornstarch Add half and half and egg yolks and whisk until well combined. Bring to boil over medium heat, stirring constantly. Boil 1 minute and remove from heat. Stir in butter, and vanilla. Stir caramel topping and coconut. This pie looks delicious, Nikki! Team Samoas for life!